Since the beginning, stories have been the primary tool used to pass down valuable lessons learned by the generations before us. These lessons help to guide us through challenges faced today. New York Times bestselling author Dan Clark has masterfully combined many of these life lessons into the pages of Soul Food: Stories to Keep You Mentally Strong, Emotionally Awake, and Ethically Straight. When asked if the stories are true, Clark writes, 'Yes. They are true to principles, they are true to heart, they are true to the soul.' Each one is written with a purpose—a lesson for those who are seeking to grow from their experiences, rather than falter through their pain. 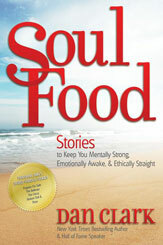 Soul Food fills readers with a steady diet of love, support, concern, and counsel. In this wonderfully crafted book, Clark touches upon the importance of understanding, self-worth, service, perspective, communication, commitment, and love, just to name a few. Whether through learning about a little girl who arrives home late from school because she stayed behind to help a friend cry, or an eighty-seven-year-old college student named Rose, each story will elicit a pause—a brief moment to reflect and to personalize the message conveyed. These stories will captivate readers' hearts and nourish their souls. A store owner was tacking a sign above his door that read 'Puppies for Sale.' Signs like that have a way of attracting small children, and, sure enough, a little boy appeared under the store owner's sign. 'How much are you going to sell the puppies for?' he asked. The young boy who had been wearing a steel brace on his left leg for the last four months walked through the front door of his home with a newly purchased puppy in his arms. The dog didn't have a hip socket, and it walked with a serious limp. The boy's selection of a physically challenged puppy intrigued his parents. The boy had been down-and-out, but with his new companion at his side, they sensed a newly revitalized spirit of hope and enthusiasm emerging from his soul. The next day the young boy and his mom went to see a veterinarian to find out how he could best help his little dog. The doctor explained that if he stretched and massaged his puppy's leg every morning and then walked with him at least one mile per day, the muscles around his missing hip would eventually strengthen, and the puppy would have no pain and less of a limp. Although the dog whimpered and barked out his discomfort, and the boy winced and hassled with his own leg brace, for the next two months, they religiously kept to their massage and walking rehabilitation regimen. By the third month, they were walking three miles every morning before school, and they were both walking without pain. One Saturday morning as they returned from their workout, a cat leaped out of the bushes and startled the dog. Ripping the leash from the boy's grip, the dog darted into oncoming traffic. With a speeding truck only seconds away, the boy instinctively ran into the street, dove for his dog, and rolled into the gutter. He was too late. The dog was hit and was bleeding profusely from the mouth. As the boy lay there crying and hugging his dying dog, he noticed that his own leg brace had bent and popped loose. With no time to worry about himself, he sprang to his feet, picked up his dog, cuddled it close to him, and started for home. The dog quietly barked, giving him hope and turning the boy's jog into an all-out sprint. His mother rushed him and his suffering pup to the pet hospital. As they anxiously waited to see if his dog would survive the surgery, he asked his mother why he could now walk and run. Just then the operating room door slowly opened. Out walked the veterinarian with a smile on his face. 'Your dog is going to make it,' he said. The boy learned that when you lose yourself, you find yourself. It is more blessed to give than to receive. A father promised his son that if he practiced, all day he'd play baseball with him after work. The father arrived home, and they went into the backyard. 'Show me what you can do,' the father said. The little boy shuffled his feet, threw the ball up in the air, took a swing, and missed. 'Strike one,' said the dad. Dan Clark is one of today's most popular speakers. As a member of the National Speakers Association, Dan has received the NSA's highest designation: Certified Speaking Professional (CSA). Dan has been electrifying audiences in all 50 of the United States and 14 other countries since 1982. Dan is a successful businessman, actor, song writer/recording artist and award-winning athlete who overcame a crippling injury that prematurely ended his football career. He lives in Salt Lake City, Utah.